Dark Politricks: Jeremy Corbyn wins another Labour victory but will it stop the Blairites? Jeremy Corbyn wins another Labour victory but will it stop the Blairites? Jeremy Corbyn wins yet another Labour election victory but will it stop the Blairites? Jeremy Corbyn has won his Labour Leadership election battle against the unknown (to me at least until this content), Owen Smith. BREXIT and what's happening with it (I have no clue). Our new unelecte PM Theresa May and how she has gone back on many of David Cameron's policies, which should really trigger a general election, but as the Labour party were in no fit state to fight one they got away with it. Examples include the re-introduction of Grammar Schools. The possibility of Scotland holding another referendum to leave the UK. China building our nuclear power station and security issues around this. So many other items to mention. This is what satirist Jonathan Pie thinks about the re-election of Jermey Corbyn. This year he won with 61.8% of the vote to Smith’s 38.2%. Last year he won with 59.5% of the vote against the other 3 candidates. This must tell you something. Maybe that the people and the Labour members want him as their leader no matter how much the press attack him all the time and try and portray him as unelectable? Are the Blairites mad, do they not realise that the Labour party and the part of the country who are left wing actually WANT Jeremy Corbyn as the leader. Not some air brushed, PR managed, speaker phone in a suit, controlled by HQ who says what he is told to, and has no real opinions or beliefs of his own like Tony Blair - except when it came to God telling him to fight Iraq with Bush as it might be Armagedom. We don't want constant US led war, like a puppy on a lead. "Lets go bomb this country now UK our Special Friend", and then afterwards whilst the people are all still fighting in a civil war, or forming new terrorist groups we can later control for our own ends, we can let all the US corporations get the oil rights such as Halliburton. Plus all the contracts to rebuild the roads and hospitals that we bombed for no reason in the first place can go to US companies formed for exactly this reason. Got to keep the US war economy GDP rolling by passing tax payers money to US military contractors. Special Friend? The only thing special about our relationship with the USA is that we get to sleep in the wet patch afterwards and have little say when the "special" part is about to start. We don't want to to give banks money at 0% interest rates whilst we all have to suffer with 10%+ or if your stuck then WONGA or 1 of the hundreds of pay day loans that have sprung up much more. Is that not a sign something is wrong? When the public have to pay 1000s of % APR for their money? Do you know the pay day loans interest rates at the moment. I could go on, but that seems wrong to me, especially when all these payday banks are owned by the same main banks at the top anyway. It seems to be one of our only growth industries in the UK at the moment along with online Bingo, Poker and Gambling sites. That doesn't say much for our economy does it? If your a normal person, I consider myself normal believe it or not, then we don't want our economy to built on services that milk the common person so that big banks get even richer and the poor poorer. No, we want to re-focus it so that we have a skilled manufacturing base, a decent job for university and apprentices to enter into after work not fill the shelves at Lidl. We want high tech, high skilled people and a way for those who have fallen off the track due to ill health or long term joblessness to get back into those jobs through free training. Not punishment by taking away benefits because they have an extra room in their flat, or they don't have a computer so that have to spend their meager benefits on bus fares into town to use the library to search for jobs as they currently have to do. Call me stupid but we don't want to privatize everything from education to the NHS. Privatising the National Railways when you think about it can't be competitive anyway due to not having the ability to have 2 trains running on the same line at the same time to the same place. Isn't that what competitiveness should all be about? Unless you are going to allow each railyway company to build their own tracks through the country (which would take decades due to planning permission and all the rest) then you should make our railways a decent public transport option for the nation by making them fast, on time, reliable and cheap. If you did all that more people would leave their cars at home, help the environment and use the trains like they do in Spain and France. Why is it in Spain I could travel overnight and back to a place the same distance as London for a couple of pounds on a clean railway when here it costs me the best part of twenty pounds, and more if it's overnight? No it has to be all about money and putting it into the pockets of companies after we have sold the rights for a few billion. It's a stupid mentality only dreamt up by the Tories and Blairites. The same goes for education. Education should be for life. People should be able to re-skill throughout their lives without forking out thousands in loan repayments. You should be able to go to University for free, another Blairite scheme that has just expanded the cost of education to those that can afford it again and again. Cut the amount of money we spend on a useless Trident scheme that relies on US GPS (so they could turn it off if we went rogue), and the trillions we have spent on wars over the last decade and we could easily afford free education for all for life. If you are unemployed you should be able to get onto any workplace training scheme or educational course you want for free. It costs a lot more to have a jobless person claiming benefits for their home, pocket and council tax for years on end than it would for a year or two at a college. We also have to admit that some of the things Blair and his cronies and followers did were bad for the country and it's future e.g Iraq, and voting in the Tories time again won't sort that out. PFI was a nightmare for a start, one that will cost over £200 billion in the next 35 years. This will lead to hospitals and schools going broke if not already due to these huge debts they are with debts for the next 20+ years. Yes we may have build a lot of new schools and hospitals due to PFI, but the one thing we didn't build was houses - why not? Was that because we couldn't find a way to allow the private sector to milk the taxpayer as they do with the others. Currently schools and hospitals have to pay contractors up to £100 or more to change a single light bulb if it breaks in a classroom instead of just calling out their handy man to do the job for them. I remember being at school with a handy man who did all the odd jobs around the place and we all loved him more than the teachers. He did everything that needed to be done and he cost a hell of a lot less than what schools are currently paying for fixing anything broken at the moment. Just think of the waiting time for the private contractors to arrive for one, and then the inflated costs all to fill their pockets. What is the point apart from a one off payment from the private company to fill whatever gaping hole the treasury currently has and then face decades of debt? Of course it doesn't worry the MP's who put it into action as they will be long gone by then. Probably working for the companies who are running the PFI schemes they helped push through parliament no doubt. Also I don't want to bail out the banks without jailing the directors as Iceland did. The people who led us into the 2008 crisis in the first place should be punished like any other criminal. I want some justice for all this mess and austerity everyone is facing. Why are we giving banks money at 0% when we could be making National Bonds for investments in house building that will return a nice profit for investors, much needed jobs flooding in and most of all provide the housing people need? These are all things Jeremy Corbyn wants to do. I can't find a fault in it so please leave your comments to what is so stupid about these policies please. Jeremy Corbyn has pledged to “wipe the slate clean” after winning a convincing victory in Labour’s bitter leadership battle, securing 62% of the vote. 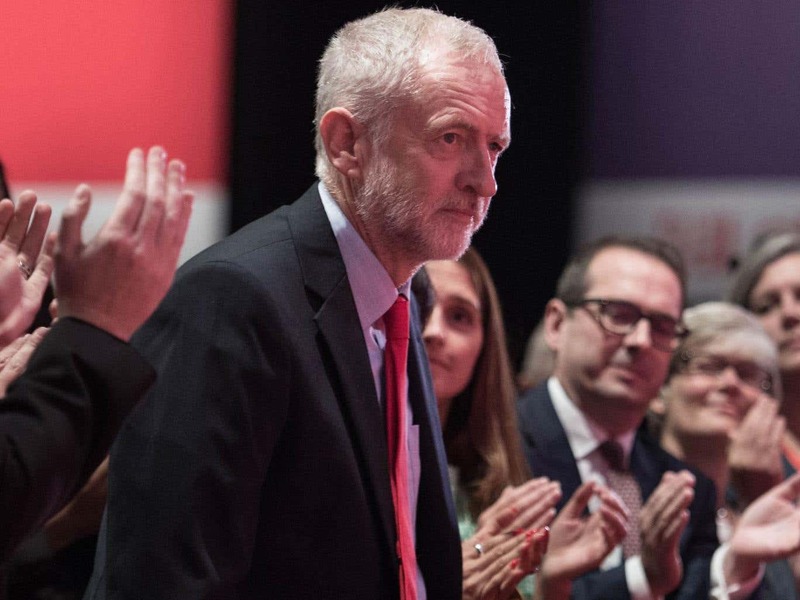 Speaking after the result was declared in Liverpool, Corbyn thanked his rival, Owen Smith, and urged the “Labour family” to unite after the summer-long contest. Corbyn secured 61.8% of the vote to Smith’s 38.2%. The victory strengthens his hold on a party that has expanded dramatically since the 2015 general election and now has more than 500,000 members. In last year’s contest, he won 59.5% of the vote. Corbyn won a majority over Smith in every category – members (59%), registered supporters (70%) and trades union affiliates (60%). View the original article at the main Dark Poltricks web site at Dark Politricks where you can get even more #altnews and daily politics away from the mainstream.